Cloud services provide the possibility for internet users to save documents, pictures, music and other files, irrespective of the device being used; the cloud also opens up possibilities to collaborate and share information with other people. 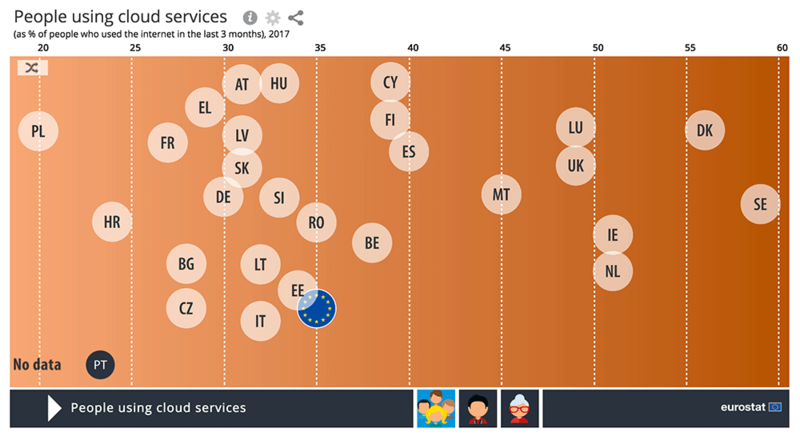 In 2017, over one third (35 %) of people in the EU who had used the internet within the 3 months prior to the survey had used cloud services; this was a 8 percentage points increase compared with 2014. Among the Member States, the share of cloud users ranged from one fifth in Poland (20 %) to more than half of all internet users in Sweden (59 %), Denmark (56 %), Ireland and the Netherlands (both 51 %). Compared with 2014, this share increased most in Sweden (+22 percentage points), while it remained almost stable in Croatia (+1 percentage point). In the EU, half of younger internet users aged 16 to 24 years took advantage of cloud services, whereas the lowest share was registered among older internet users aged 65 to 74 years, of whom 20 % used these services. In 2017, the use of cloud services was most common among younger internet users in Sweden (74 %) and Malta (71 %) and among older internet users in Denmark (38 %) and Luxembourg (35 %). Instead of building or expanding their own IT infrastructure, businesses can access computing resources such as cloud services hosted by other parties on the internet. In 2016, practically all businesses in the EU (97 %) had access to the internet. Among them, 22 % purchased cloud computing services; this is a minor increase compared with 19 % in 2014. This share was considerably higher for large businesses (45 %) than for SMEs (21 %). 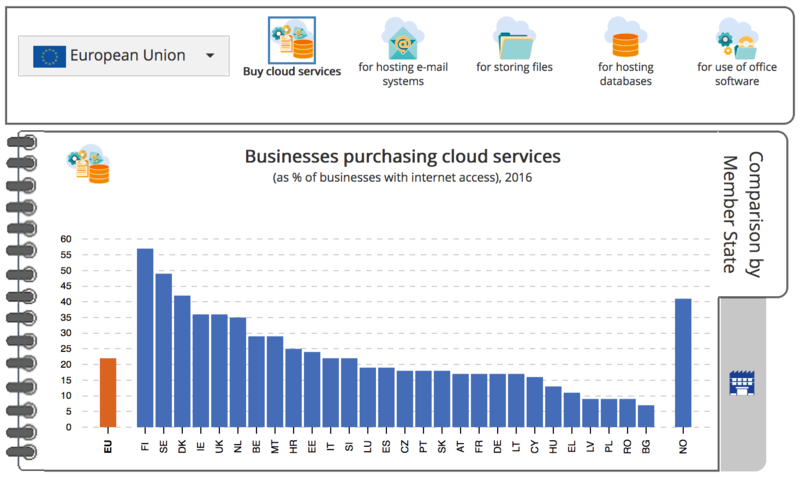 Among the EU Member States, the purchase of cloud services by businesses in 2016 was most common in Finland (57 %), Sweden (49 %) and Denmark (42 %). Businesses may purchase cloud services for a variety of purposes such as hosting their e-mail systems or databases, storing files, using software applications and many more. Among EU businesses which purchased cloud services in 2016, the two most common purposes were hosting e-mail systems (65 %) and storing files in electronic form (62 %). Businesses also commonly use cloud services for hosting their databases (44 %) and to use office software (41 %). With this technology businesses can also access more advanced and specialised software applications, for example for finance or accounting software which was done by 32 % of businesses or customer relationship management software which was used by 27 %. For both SMEs and large businesses, the main purposes for buying cloud services were storing files (both 62 %) and hosting e-mail systems (65 % of SMEs and 54 % of large businesses). Looking at these two purposes among businesses in the EU Member States, more than 80 % of businesses in Italy (85 %) and Slovakia (82 %) used cloud services for hosting e-mail systems, while more than 70 % of businesses in Ireland (75 %) and Cyprus (72 %) used the cloud to store files electronically.